From the bus stop near to Mistra Bay this walk goes up hill to Mellieha Town, via Selmun Palace, then it's downhill all the way to the sea at Mellieha Bay. On the other two Mellieha Walks we had started at Mellieha Town, on top of its hill, and walked downhill to the coast. Yes, there had been one or two ups but generally we had descended. Today would only be a short walk. Probably no more than 4 miles but we would have the "enjoyment" of walking up hill. Our starting point was the bus stop nearest to Mistra Bay, where we alighted from a number 45 bus. Leaving the main road we took the Mistra "lane" which lead us under the main road and in less than half a mile we were at the base of the "concrete" path – the one we he walked down on our first walk in the area - that lead to Selmun Palace. As you have probably realised by now we had developed an infatuation with this corner of Malta. We definitely must have because on the hot day we were enjoying most of the locals, and certainly the visitors, would have considered it stupid to ascend such a path for fun. But we enjoyed it. We were as impressed with the views as much as we had been on our first walk in this area, and needless to say Anne was still drooling over the flowers. At the top of this ascent, we could see across the fields to the desolate Fort Campbell. 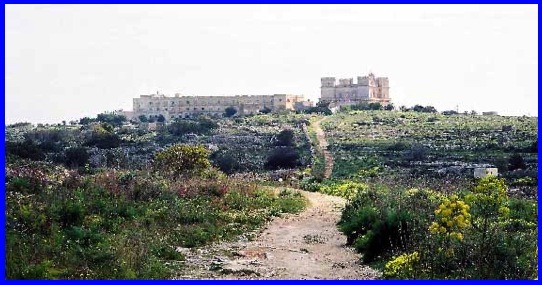 However, we took the path towards the "Palace" and then went left away from it following the road towards Mellieha. The view across the flower filled countryside towards Fort Campbell. We were looking for a path on the right that would go down to Mgiebah/Selmun Bay, the one that the "quartet" I met on an earlier walk had missed. There was a path going east from the Palace but I had read that there was one opposite the little church, which was only a short distance away. On reaching the church we turned right, passing close to some houses. 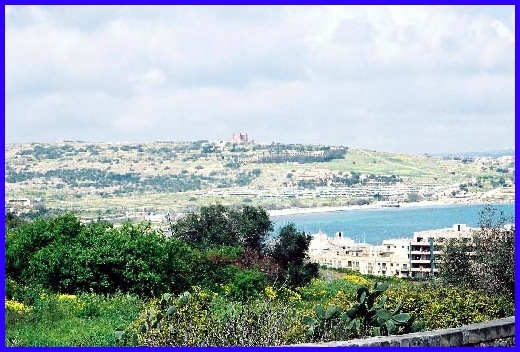 Soon we were in open country again with views of the "Palace " to our right and Mellieha Town to our left. On reaching a crossing of paths we realised that the right path would take us back towards Selmun Palace, which was probably less than a quarter of a mile away. Straight on would have taken us to Mgiebah/Selmun Bay. 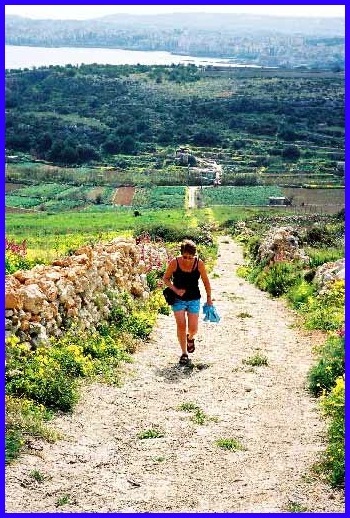 Next time we come to Malta I am definitely going to walk this path and I don’t think Anne will take much encouraging to accompany me. Selmun Palace with its namesake hotel to the left. This view was taken near the path to the Mgiebah Valley. I read somewhere that the Mgiebah Valley, which this track goes through, is noted for its market gardening and certainly the views make it a must for the future. 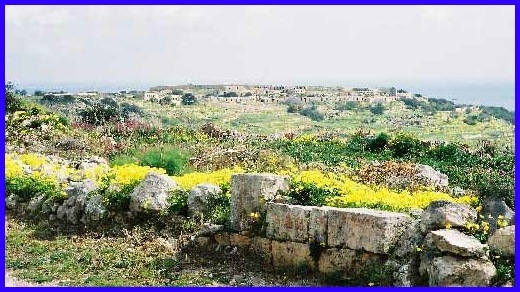 But this time we turned left, on to the path, which took us to Mellieha Town. The route was very straight forward. We followed the path to a road. Turned left and within about a third of a mile reached the main road that passed through Mellieha Town, almost opposite the Belle Vue Bakery. Needless to say we went inside to see if anything took our fancy but in the end decided to follow the main road into the town proper and get one of the previously mentioned loaves of tuna, onions and olives from George’s, the bakery that we tend to favour. However, before eating this fare it was necessary to visit a few Mellieha jewellers’ shops before taking the road down to Mellieha Bay where we found a quiet little spot by the sea to enjoy our food. The view on the way from Mellieha Town to Mellieha Bay. The Red Tower can be seen in the background. The way back was very easy. We just walked along the bay until we reached a bus stop and caught a Number 45 back to St Paul’s Bay. It had been a very enjoyable excursion. 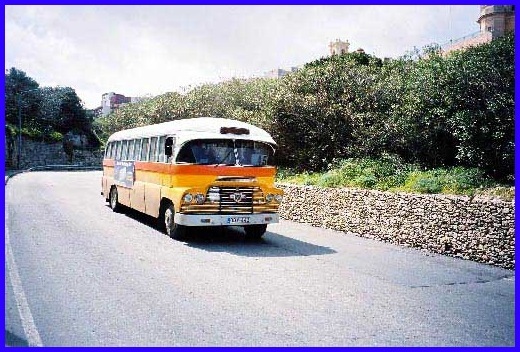 The number 45 Bus on its route down hill from Mellieha Town to Mellieha Bay.